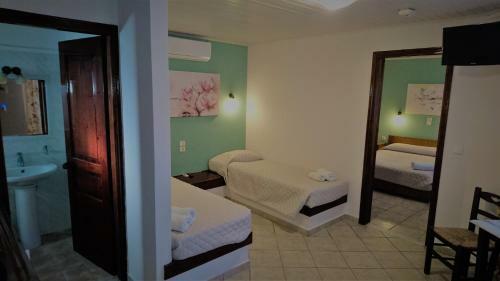 Doras Zante Studios & Apartments is located in Argassi, Zakynthos. The hotel common facilities include garden	and outdoor pool. The property accommodates visitors in studio, family room, 1 bedroom apartment and other might be available upon request. The rooms offer garden view, mountain view, landmark view and pool view. Amenities of the rooms include air-conditioning, tv, fridge and more. In the kitchen there are fridge, kitchen utensils and hot plates. All areas are covered by free Wi-Fi. Doras Zante Studios & Apartments does not accept pets.